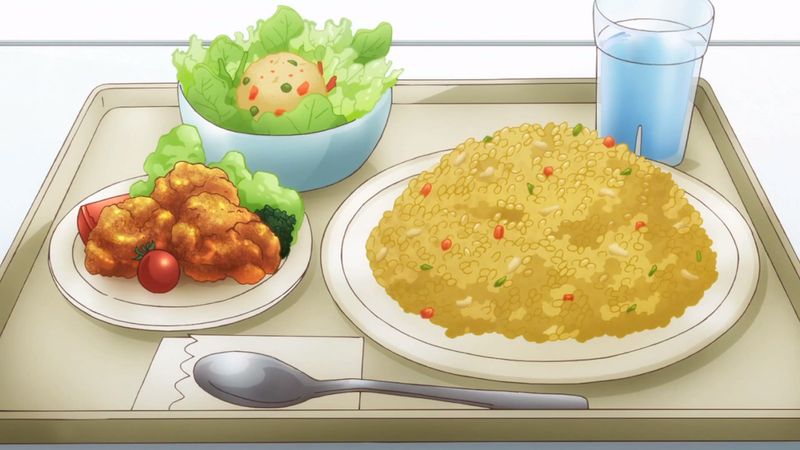 Found in just some of these series A-Channel, Brothers Conflict, Glasslip, Say I Love You, Kofuku Graffiti, Food Wars (see food wars recipes for variation). 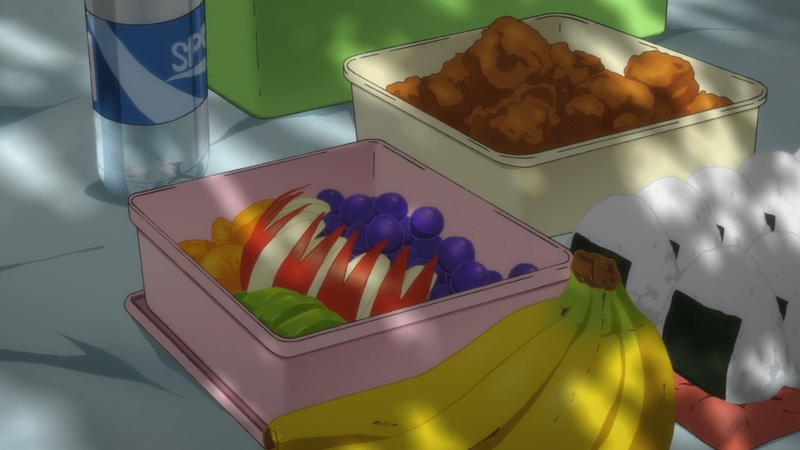 Its a popular dish and pops up in a lot of series. 1. Salt and pepper the chicken. Place chicken, ginger, garlic, soy sauce, sake, sesame oil, and sugar in a large bowl. Mix well to combine. Cover and let the chicken marinate in the refrigerator for at least 1 hour. 2. Prepare your oil for deep frying by heating it to 320-338F (160-170C). While the oil is heating, whisk together potato starch and flour in a small bowl until well combined. When the oil has almost reached temperature, add the potato starch and flour mixture to the chicken. Mix together so that the chicken is coated. The resulting mixture will be sticky with some pockets of dry flour and potato starch. There is no need to mix it too evenly, as the uneven batter will add texture of the chicken. 3. Working in batches, gently add the chicken into the hot oil, piece by piece. Turning the chicken over in the oil so that it cooks evenly, cook for about 90 seconds, or until the chicken is light golden and cooked through. Remove cooked chicken from the oil and set aside on a paper towel lined plate or wire rack placed over a rimmed tray to drain any excess oil. 4, Continue cooking the chicken in batches, return the oil to temperature between each batch of chicken, and removing any crumbs from the oil using a fine meshed strainer to keep the oil clean. 5. When all the chicken is fried, raise the temperature of the oil to 356F (180C). Refry the chicken in batches until deep golden and crispy, about 45 seconds. Transfer to a rack or paper towel lined plate. Serve immediately with lemon wedges as an appetizer or side dish. Tips and some background on the dish. 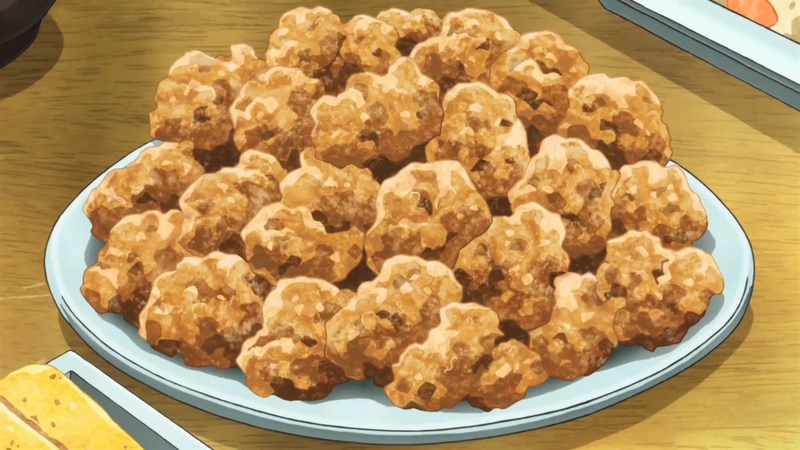 Karaage refers to a deep frying method where items are seasoned with soy sauce, ginger, and garlic, and then coated in a flour and potato starch mixture. Lightly battered and packed with plenty of flavor, this chicken dish makes for not only a great side dish, but is also a perfect addition to a bento! Simple and delicious, chicken karaage is surprisingly simple to prepare – with the exception that it does require deep frying using a pot of hot oil… But, don’t let deep frying daunt you! If you’ve never done it before, I think this dish is a great place to start since it’s pretty forgiving, compared to more complexly battered items such as tempura. 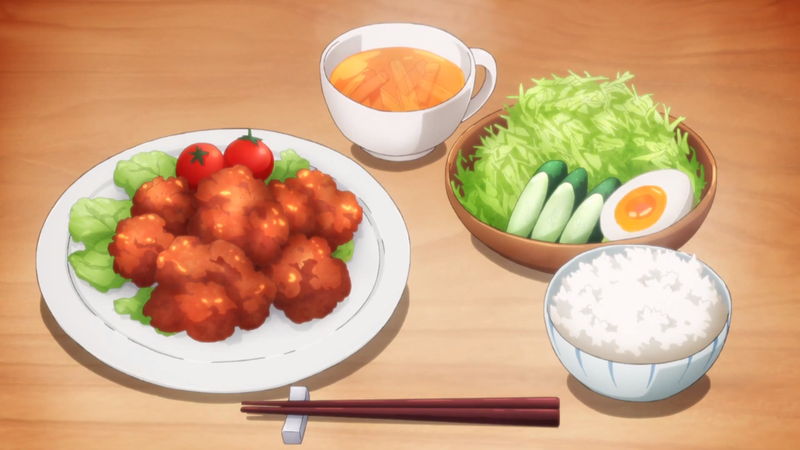 In anime, chicken karaage is commonly seen as a side dish, particularly in bento. Its dark golden brown color is easily identifiable, and can be found in series such as Glasslip, Fate/Stay Night: Unlimited Blade Works, Ookami Shoujo to Kuro Ouji,Free! : Eternal Summer, as well as a host of other shows! Use a thermometer: instead of trying to guess whether the oil is hot enough or not, use a thermometer so that you can more accurately fry your foods. I use one that clips onto the side of the pot so that I can always get a gauge on the temperature without fiddling with yet another utensil. The temperature of the oil should be between 320-338F (160-170C) before you start frying. If the temperature of the oil is too low: the chicken will absorb too much oil while frying. If the temperature of the oil is too high: the chicken will brown very quickly and runs the risk of burning. Do not overcrowd the pot while deep frying: doing so will cause the temperature of the oil to lower quickly, causing the food to cook improperly. Also, the oil may bubble up, which might overflow your pot. Place cooked items on a paper towel-lined plate or on a metal rack fitted over a rimmed tray to drain away the excess oil. Between each frying session, use a fine meshed strainer to remove any crumbs from the oil that might have dropped during the frying process. This step will help keep your oil from darkening by preventing the crumbs from burning in the oil. Keeping the oil clean also prevents burnt crumbs from sticking to your cooked foods. After removing the cooked food from the oil, let the oil return to temperature (between 320-338F, or 160-170C) before starting your next batchof deep frying.